This approach enables the OEM product development team to focus on their mission critical application and holistic product design, not the performance of the hardware. ODMs drive improved system performance, reduced time-to-market, and market leadership. 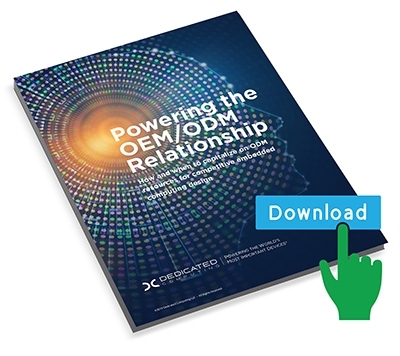 “Smart Design and Market Leadership: 2 Requirements for Powering the OEM/ODM Relationship” provides OEMs a simple road map for how to get more out of your industrial PC supplier. OEMs requiring embedded computing systems with components off the shelf (COTS) should be leaning on their partner relationship for in-house capabilities such as engineering, system design, and tolerance testing for thermal, electrical and acoustic performance. Engineering product success starts early in the design process. ODMs can add a unique development perspective – a holistic approach that is both collaborative and engineering-focused, helping OEMs meet end-user goals on day-one and throughout the entire life of the OEM’s product. With awareness to the product requirements such as performance targets, environmental challenges, quality expectations, and time to market, ODMs can value-engineer with smart off-the-shelf components as well as decades of supply chain relationships to handle extended product life and change management. When off-the-shelf is not an option, ODMs offer in-house electrical, mechanical, and software engineering expertise to meet otherwise impossible needs with custom designs for enclosures, electronics and applications. ODMs focus on solving these kinds of problems with ongoing R&D – continually asking themselves ‘what computational needs are the OEMs going to require before they know they need it?’ Value-added relationships are the result, protecting OEM resources, enhancing system performance, reducing time-to-market, and creating market leadership. Click HERE to read more. Then connect Engineer-to-Engineer with Dedicated Computing if you’re exploring the new standard for a PC supplier partnership. Swing by our LIBRARY Section for additional captivating content for Global OEMs.